It was time to move on from the heat and humidity of Durban. Syd kindly accompanied me out to the Natal Midlands, where we hoped we might find Kniphofia ichopensis and Kniphofia buchananii, but we only managed to find more populations, albeit good ones, of Kniphofia laxiflora as well as Kniphofia tysonii. 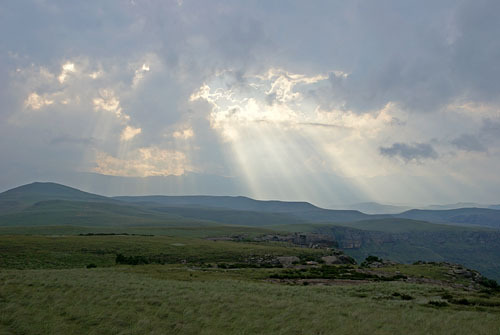 I then carried on back to the Drakensberg, where I will be spending the next 5 days. I have arrived at a guest farm called Heronmoor, situated above the damp meadows that lie at the base of Highmoor and Giant’s Castle. After settling in, I was asked if I would like to see a nearby waterfall by my hostess, Ruth. So we set off in her landrover, up the rough forestry tracks to the cliffs that border Mount Lebanon. Having hiked up a small pass onto the grasslands above, we set off across a couple of kilometres to the waterfall. Although the hike was not as tough, there were flashbacks of the Mount Sutherland hike, for we saw no pokers along the way until the fial valley where the waterfall was, Kniphofia laxiflora again, and just as we arrived the clouds rolled in and the thunder started to rumble. Fortunately, not only was it less distance back but the thunderstorm never developed to the same extent as the one a few days ago. Although, it was an unexpected addition to my day, it was a wonderful hike to a part of the Berg that I would have been very unlikely to have got to any other way. 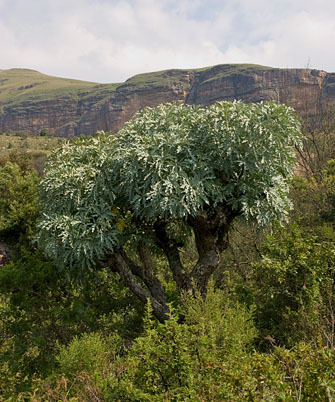 Plant of the day: Cussonia paniculata – known as the mountain cabbage tree, this is one of the unmistakeable trees of the Berg. It forms a small domed tree, with deeply lobed grey-green leaves and corky bark. 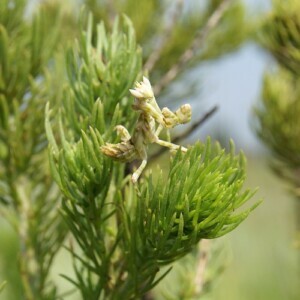 Bug of the day: Praying mantises must be one of my favourite insects, they come in so many shapes and sizes often with very elaborate camouflage. I cannot tell if this one was trying to be camouflaged or just eye-catching. 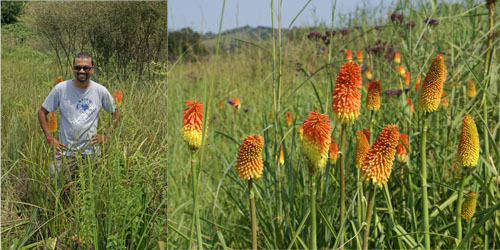 Cussonia, Drakensberg, Highmoor, Kniphofia, Kniphofia laxiflora, Natal Midlands, praying mantis. Bookmark.